Want to know one of my favorite things about Trader Joe's? At the local store, at least, they are routinely some of the friendliest, knowledgeable, and conversational retail workers I've ever encountered. Most of them are quick to give a quick, honest opinion whether good or bad (like the clerk giving me a knowing nod and slightly uneasy "yeah" when returning these catastrophes) and just genuinely nice. Compare and contrast to the way I usually feel "tolerated" by the cashiers at the local big chain. On one of my last shopping trips there (because TJ's, unfortunately, doesn't carry everything) the clerk was literally slamming and throwing my groceries through the scanner and down the belt because she was "tired" and "felt like (unprintable)" ... if I hadn't spent half an hour in line and just wanted to go home, I would have reported her to management. I'll do something more effective and choose not to spend my dollars there. It's sad when your most courteous service comes from the self checkout that insists you have to put your item in the bag and have it "settle"in there in five seconds or the alarm goes off. I mention this because on our last trip, I picked this package of tortelloni, and the clerk happily chirped that this was her favorite of the burgeoning microwavable pasta selection TJ's offers. This started a nice friendly little conversation about this blog, and if you, Mrs Nice TJ's cashier, are reading this, I dedicate it to you. 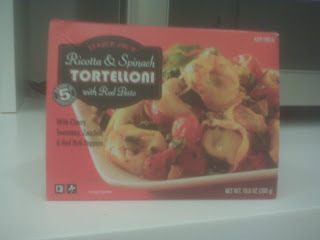 Okay, the tortelloni ... how's that different than tortellini? And shouldn't this really be Trader Giotto's goods? I'm glad I'm not the only one who forgets about him. Questions aside, this is some decent stuff. I'm not the biggest fan of ricotta and related cheeses. I'm sure it's not exactly Grade A creamy matter they stuff the pasta with, but it's gets my stamp of approval, with a caveat. Not sure if it was the work microwave's fault, but some of the stuff seemed to get a little overzapped and grainy in small pockets here and there. But it's pretty passable even for someone on the fence like me, and it helps that the pasta good and firm, not limp like some other stuff.. The pesto sauce is fairly zesty with all the basil and Italian spices, and even has a little kick. The veggies in it are decent - they definitely taste grilled, and are quite flavorful, but they're kinda squishy. It'd be nice if zucchini and peppers were a little crisper, but I guess between grilling, freezing and nuking there's only so much that can be expected. You get a fairly generous portion, even for someone with a larger appetite like me. Between this and an apple, I was pretty satisfied the rest of my work day. Pretty simple to make, too - just take off the surrounding cardboard, peel a corner of the top film off, zap it, and three minutes later you got lunch. Good tasting stuff. But I have a complaint to make. I hope it's at least somewhat valid. But I love containers, simply because they can "contain" things. What things? Anything! And if you get them for free somehow, like with a food purchase, even better. Chinese takeout Tupperware is the king of this. I routinely save any and all beer case boxes to store stuff in the basement. Sandy, when preparing to move in, had to take quite some time convincing me it was okay to throw out the stack of clementine crates I had accumulated and saved over many a scurvy-busting session. It didn't matter that the crates were empty and had been for months - they could hold something and be useful and just didn't belong in a landfill when they're perfectly fine. Seriously, I was nearing Hoarders-level obsession with this kind of stuff - my house was going to turn into a literal container of containers. I'm getting better (thanks, wife), but still ... this stuff comes in a plastic squarish bowl thing. It doesn't have a lid (just that film over top) and it's kinda flimsy-ish (suitable enough to get your lunch from the freezer to your belly), but it's just solid enough to suggest (to me, at least) that it shouldn't just be tossed and to instead find another use. I knew I couldn't bring it home or Sandy would give me the stink eye for sure. I tried to think of what I could put in it for work - about the only thing I could think of was paper clips, and I've used three of those in the last year, so that didn't seem too beneficial. And since it was lidless, it'd be tougher to re-use as a food container. To compound the issue, for whatever reason, my work doesn't have lunchroom recycling, so it wasn't a matter of just tossing it in a bin. I was genuinely conflicted about what to do ... environmental responsibility vs psychological/obsessive-compulsive indulgence vs domestic tranquility ... well, I won't say what I did, but I feel ashamed. Lunch shouldn't make you feel that way. Good thing it was tasty. Sandy hasn't tried this and never will. There's not only cherry tomatoes in it, but also they're deliberately cut in half to spread their tomatoey guts everywhere. It's a nonstarter for her. So I'll just double my score ... I'll give it a solid seven overall. Give me a real lid for it, and we'll revisit this. Yes. Solid 7. Agree with you 100%. omg i am so glad to know i am not the only obsessive container collector! it drives my family nuts ("WHY is there mexican rice in the butter container??") but hey, it is environmentally friendly, right? Well I'm just as bad, or good depending on your viewpoint: I keep those containers and try to reuse them until they "die" on me or recycle them. I even take them home to recycle, if not possible at work or wherever. It's nice to know I'm not the only one who does this. Glad to have company. Now if only all people did this... imagine... that would help our world a lot. I found this review while searching for reviews of TJ's refrigerated spinach tortellini. Please review it if you haven't already! I was wondering if anybody else found it to be as devoid of either cheese or spinach flavor...or any flavor at all...as I did. Love your blog, thanks! Solid 8/10 from me and my boyfriend on this one. Mmm mmm. Great for a quick lunch.